A Supreme Court decision in favor of one protesting village has inspired others. Ten shouting Palestinians were pushing against one boulder, but the primitive Israeli roadblock cutting off the tiny Palestinian village from Bethlehem was not budging. Then, with the help of two giant crowbars, an Israel protester, and a Japanese backpacker, the group heaved the stone aside, opening the road for the first time in three years. Inspired by the experience of other Palestinian villages, the Al Walajeh demonstrators are part of a small but growing core of protesters combining civil disobedience with legal petitions to fight Israeli policies. Earlier this month, the village of Bilin, which has held weekly protests since 2004, garnered widespread attention and praise in the Palestinian press when the Israeli Supreme Court ordered a part of the military’s separation barrier near Bilin to be dismantled. Increasingly, other Palestinian villages are following Bilin’s lead, though it remains to be seen whether this kernel of nonviolence will grow into a full-fledged movement. 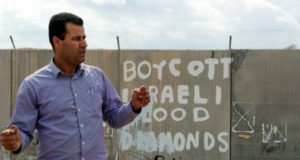 While Palestinian militants dominate international headlines through suicide bombings and firing rockets on Israeli towns, residents of Bilin and a handful of other tiny farming villages like Al Walajeh have eschewed the armed struggle. Instead, they have linked arms with Israeli peace activists and chained themselves to trees to delay Army bulldozers cutting a swath for an electronic fence severing the villagers from their land. Though Palestinians glorify the armed militiamen and those killed in battle with Israel, protest leaders say the nonlethal tactics have one crucial advantage: it attracts Israeli and international peace activists, who in turn bring sympathetic media coverage. The leaders sound like a Palestinian version of Martin Luther King Jr., and their voices have become more prominent in the ongoing debate about whether peaceful or military actions will win their statehood. “We use nonviolence as a way of life…. We learned from many experiences: like India, Martin Luther [King], and South Africa,” says Samer Jabber, who oversees a network of activists in the villages surrounding Bethlehem. The strategy paid off when the Supreme Court ruled that the current path of the fence around Bilin offered no security advantages. Villagers will now be able to reach their crops without having to pass through gates in the fence manned by soldiers. 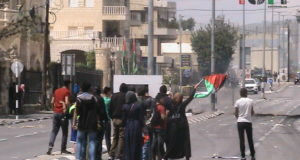 In Al Walajeh, Ms. Alaraj says the protests would be meaningless without a challenge in the Israeli courts. Villagers fear that the construction of the separation wall – set to be more than 400 miles long total, affecting 92 Palestinian communities – will leave the hamlet completely surrounded. Even though the Bilin ruling was not the first time the court ordered a portion of the barrier moved, it has resonated widely among Palestinians. 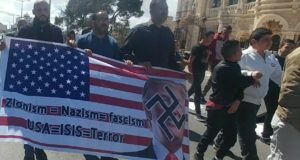 “It has become obvious that popular civil resistance has become the best way for national resistance from the occupation,” wrote Waleed Salem in an Al Quds newspaper op-ed. The civil disobedience taps into Palestinian nostalgia for the first intifada in the late 1980s, marked by grass-roots participation and stone-throwing.The current uprising is led by a network of underground militias, most of which have ties to political parties. Just three months after Palestinians watched Hamas’s violent takeover of the Gaza Strip from the Fatah-run militias, nonviolent protest against Israel is being seen as a way to heal rifts among Palestinians.